Problem #1: the week 7 veggie box shows up with just over 2lbs of bok choi in it. Holy carp…what am I going to do with TWO POUNDS of bok choi? …and then I said, “What if we use bok choi instead of taco shells?” We had taco shells in the house. As a matter of fact, we had two boxes of them, due to a shopping oops on my part a few weeks before. Still, the idea intrigued him. “So, what – it would be like the lettuce cups from PF Chang’s?” he asked. Yep, that was the idea. Note also that this is a bit healthier than using the shells – at least 100 cal less. And, you get all the benefits of the hard shell (crunch!) with the benefit of the soft taco (no breakage!). It’s really a win-win situation. Bok-os: Crunchy, soft, healthy...what a combination! 1. Dice the chicken breasts (small pieces) and cook with the olive oil in a large non-stick skillet over medium-high heat. 2. 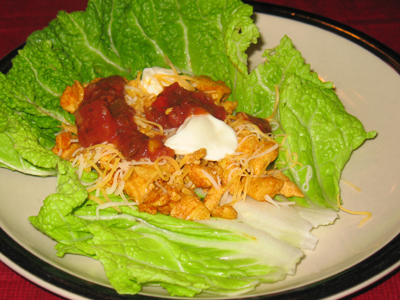 When the chicken is fully cooked, add the taco seasoning and water; stir to combine and stir frequently throughout cooking to ensure no sticking. 3. Once the majority of the liquid is gone from the pan, remove the chicken from the heat. Serve on leaves of bok choi (one per person), with the toppings of their choice, and fold the leaf as you’re eating it (like a soft taco shell). This entry was posted in entrees, locavore and tagged chicken, cooking, CSA, eat local, locavore, meals, vegetables by crunchymetromom. Bookmark the permalink. this looks tasty – can’t wait to try it.